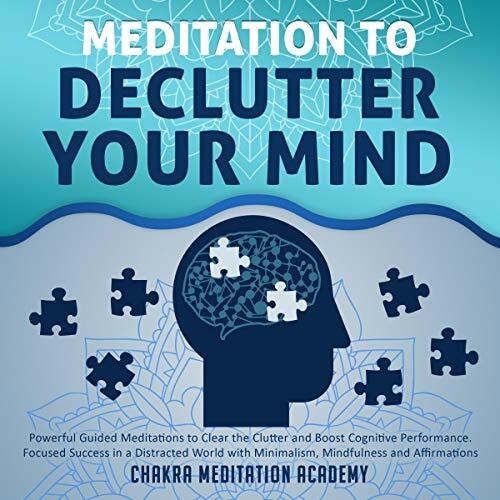 Clear the clutter with meditation, mindfulness, essentialism, and minimalism. Decluttering and minimalism emphasize finding happiness via exploring life, interacting with your loved ones, and, most of all, by focusing upon creating a state of mind that makes you happy. The power of meditation and mindfulness can help you to clear your mind of unhelpful thoughts, control your stress, and achieve success. Even applying one or two things inside could result in increase in your confidence, self-esteem, mood, and sleeping patterns. If you would like to design your dream life and clarify your values, if you would like to begin to develop positive habits and live intentionally, and if you would like to connect with your authentic self and let go of resistance, then this is the audiobook for you. Let this audiobook help you unwind from daily stresses with meditations designed to help you clear your mind and simplify your life. When you wake, you'll feel more energized and motivated, and start seeing real results. It put me to sleep and I have never heard the last half of the thing. I did not need help falling asleep. I needed help with dealing with a traumatic experience I had. The nice thing about this audiobook is it's narration, which is really smooth and pleasing and helpful in positive thinking instantly.. Loved every single bit of it. Easy listen, excellent narrator, smooth story. Loved the fact that meditations are ordered at the end of the book. I listen to this before I go to bed at night, and it really helps me obtain a good deep sleep. This is an impressive bundle of meditations. They are simple and easy but I felt very relaxed after every one of them. I don't do them all at once, that's too much. I have big issues with sleep due to trauma and anxiety following a car hitting our house, this has never failed to send me off no matter how bad the traffic outside is and however much the house shakes! absolutely wonderful!!! love it!! I've used Chakra Meditation Academy explaination as part of my presentation's before, and they were extremely popular. I highly recommend his works if you want to teach yourself mental discipline, and change the way you think about business, life, everything. Another fantastic listen and I hope to purchase more from him. I would recommend these books anyone looking to gain some knowledge on this subject. It is worth listening. It provides a great information and practice exercises which are helpful in understanding the concepts of it!! I occasionally have periods of insomnia, often weeks on end. It didn't seem to be working. But I stayed with it, listening every night. It only took a few days, and now it works like a charm, every time. If I awaken during the night and have trouble falling back to sleep I just play it again! My youngest child (13) started having trouble sleeping. I suggested she use Deep Sleep, a typical teenager, she protested loudly. But she got desperate and gave it a try and it works for her. My nineteen year old uses it too. I hope others find it as helpful as my family has!